Wow, everyone needs to spread the word about this site, your knowledge and responsiveness! Your a gem! 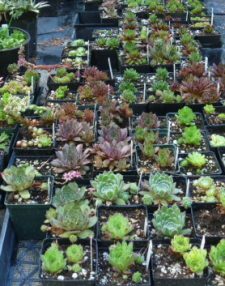 Ok, so from your site, I believe our plants are sedum and as I'll call them the 'super'vivum. The parent plants are definitely rosette forming plants. The new growth, from dispatched leaves, is healthy and vigorous but is growing upwards on stems. I imagine we need to pinch this. How low do we go?! How is this done to get the rosettes, like your photo, close to the ground? 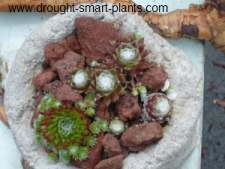 The plants in the photo are Sempervivum, and their normal growth habit is rosette forming, unless they start to bloom which is pretty obvious as the whole plant starts to elongate, or 'cone'. Once this happens, it's game over for the plant, as they are what is known as 'monocarpic' or 'once flowering'. The plants growth habit can't be changed by pruning it or any other cultural factors. I'm not 100% sure that this is what you have from your description, but without a picture I can't ID them. Can you post a picture on this page: Succulent Plant Identification? - just start a new post. We'll keep on goin' and growin'! Return to School Succulent Project.